Buy the right asset and maintain quality underwriting standards, and you won’t need to time the next correction, Hessam Nadji says at RealShare Apartments. “Where are we in the cycle,” has become the staple question at every real estate conference, and as we move later in this cycle, the question has only become more prevalent. Hessam Nadji’s advice at RealShare Apartments this week: Don’t try to time the cycle. Instead, focus on buying the right asset and implementing quality underwriting standards. 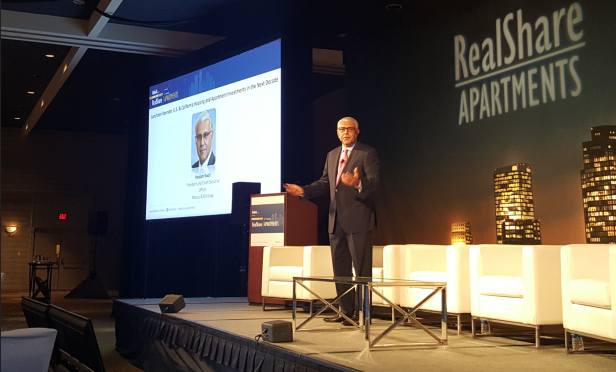 Nadji, president and CEO of Marcus & Millichap, spoke as the keynote speaker on the second day of the conference in Los Angeles. “The picture doesn’t look all that bad,” said Nadji in the opening of his speech, as he gave a snapshot of the current market. In the last decade, there has been population growth, the formation of new households and the lowest unemployment in 50 years. While GDP growth has been slow and steady this cycle, since 2007, it has equaled the size of Japan’s entire economy. Overall, we are in a high growth low inflation economy. The future prospects are also positive, namely the demographic trends. While we have an aging population—like much of the world—with 10,000 people every day turning 65, we also have 12,000 people a day turning 21. This dual demographic wave, Nadji said, is a huge opportunity, especially in the multifamily market.